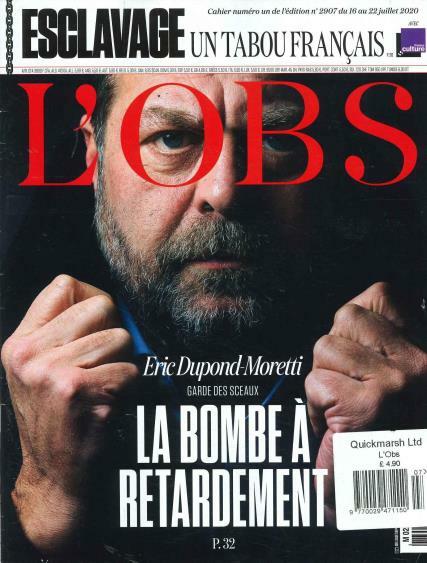 L'Obs is the French number one magazine that brings you in depth news from all over the world in the fields of economics, society, politics, culture, sports, health and technology. Buy a single copy or subscription to L'obs magazine. The expert team of journals, writers and editors are dedicated to fetch you an enjoyable read while also making you aware of the international news and updates. The magazine was founded in 1964 and ever since then it has been continuously providing the best of information. It is usually identified as the intellectual magazine. The magazine majorly covers the political, cultural and economical issue of Africa, Middle East and Europe. With 51 issues per year and with politics being its strongest forte, the magazine has extensive news coverage of political changes and issues that are more relevant in the current time. Special and secular treatment to the news articles makes the Nouvel Observateur weekly is the most trusted and respected magazine.